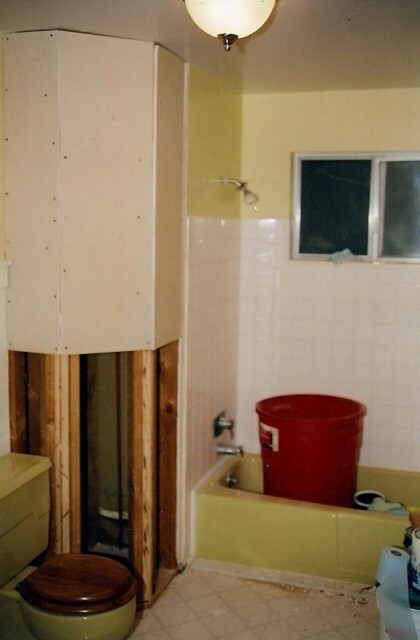 Today I wanted to highlight my dad’s guest bathroom remodel. He did a terrific job with this project. He was very conscious about cost and reusing what he had to make the project a success. He did the bulk of the work and while we were in town we helped do all the painting and trim work to finish it up. 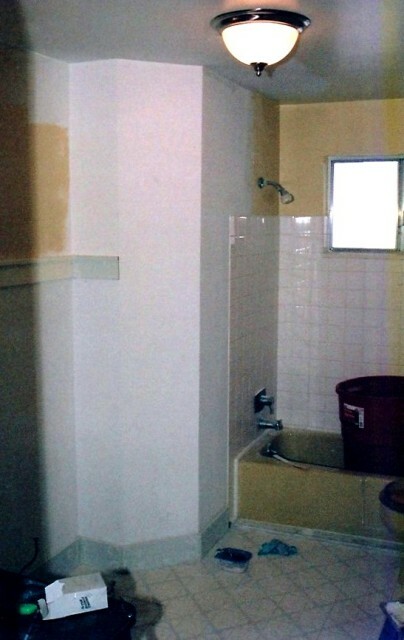 This is part of the before picture of the guest bathroom. 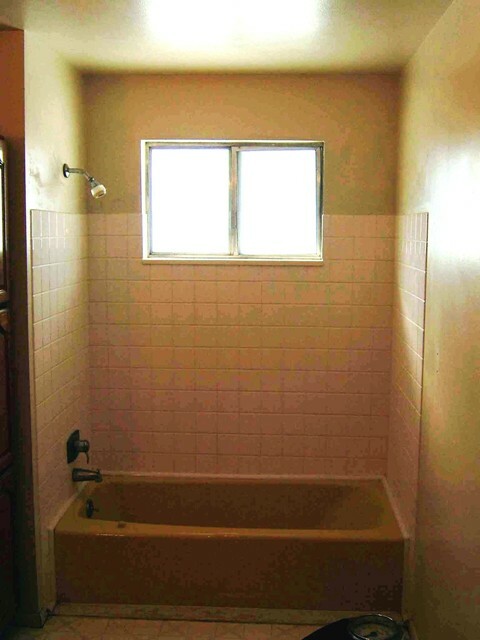 To keep costs low we chose to keep the toilet and tub, even though they were a matching mustard yellow color. 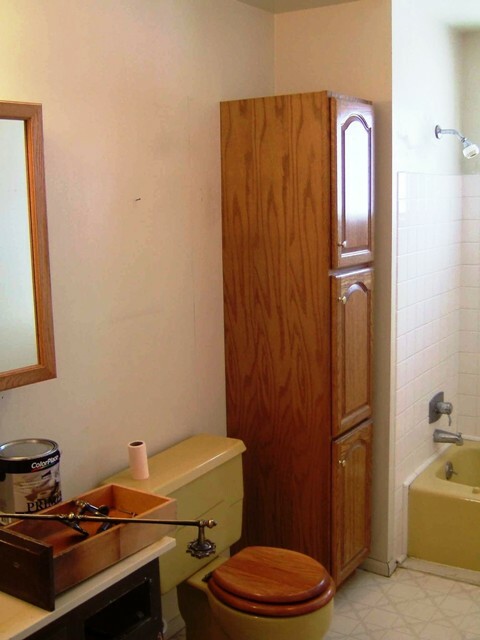 The decorating colors were coordinated to complement the toilet and tub. The current floor was white linoleum and we chose to replace it with white tile. and move the toilet. 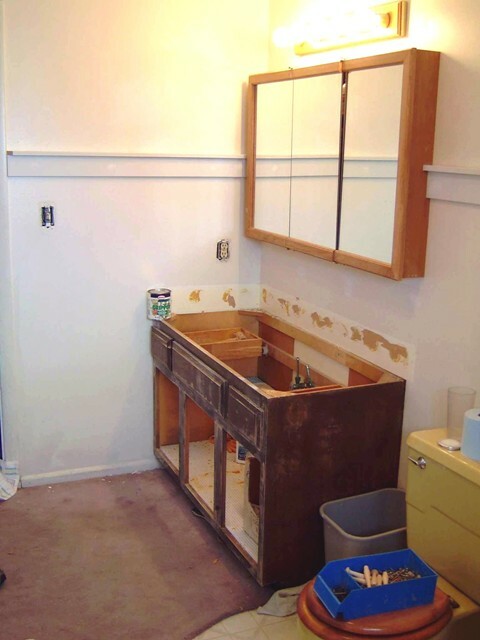 The vanity cabinet was saved, stripped and repainted. particle board was installed and tile backer board screwed into place. extended corner, to add room to the new future master bathroom remodel (which I will show you later) on the other side of the wall. To give the new corner more flare, we put a forty-five degree angle on it, as seen in the next picture. 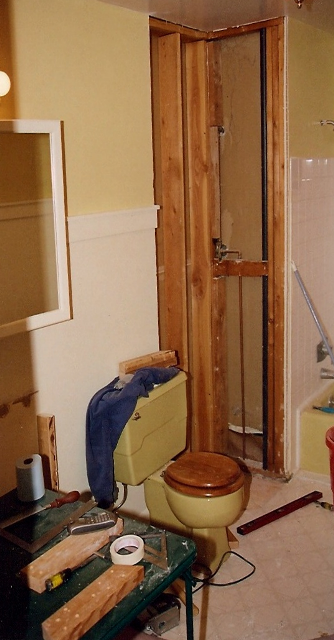 The framing seen in this picture will be removed once the new wall is framed and drywalled. With the corner wall framing complete, the drywall went on next. because it was next to the toilet and tub. Wall trim and baseboard comes next. 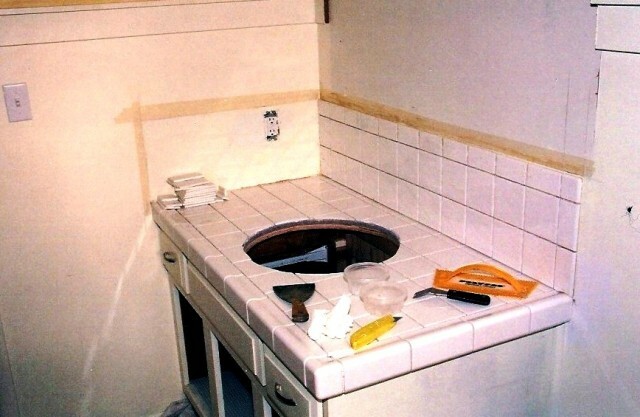 sink is sitting in the cabinet top hole for fitting. attractive so it was eventually replaced it as you can see in a later picture. My daughters are in the middle of the painting process. 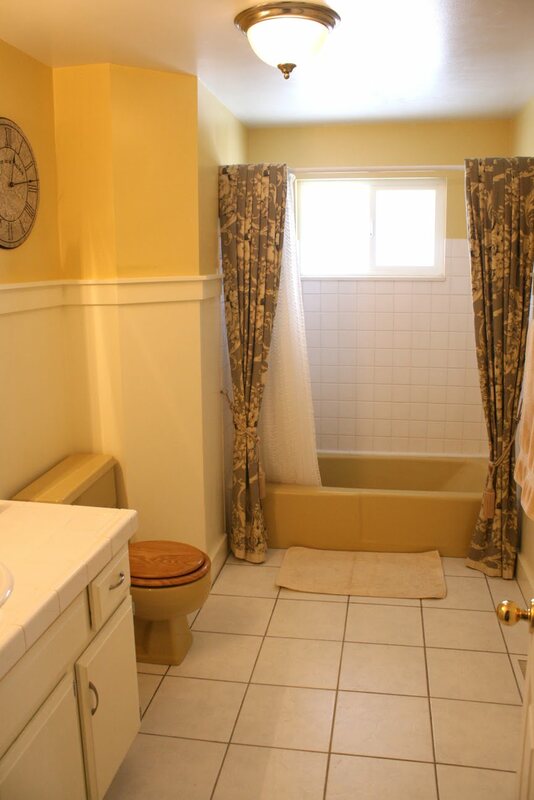 We selected a golden tinted paint for the upper half to compliment the tub and toilet color. 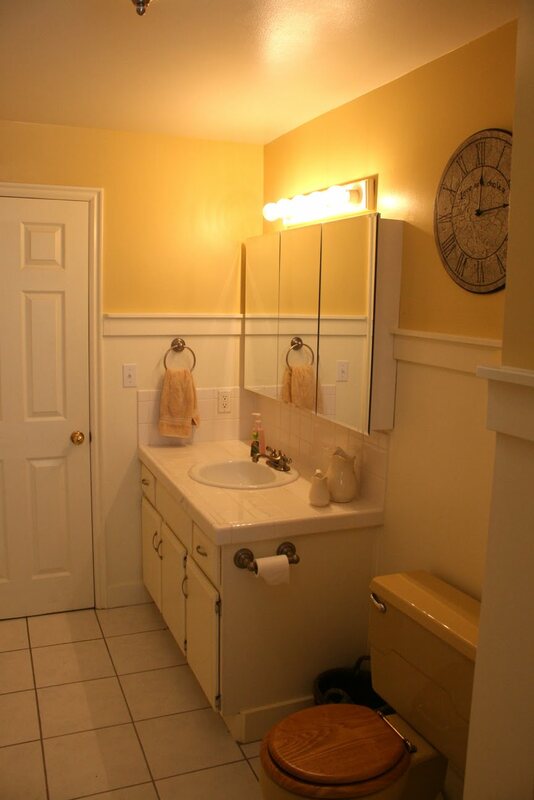 This also helped to bring down the garish tub and toilet color a notch and brought the bathroom together. visible from the entry to the house, cuz who wants to get caught with their pants down! 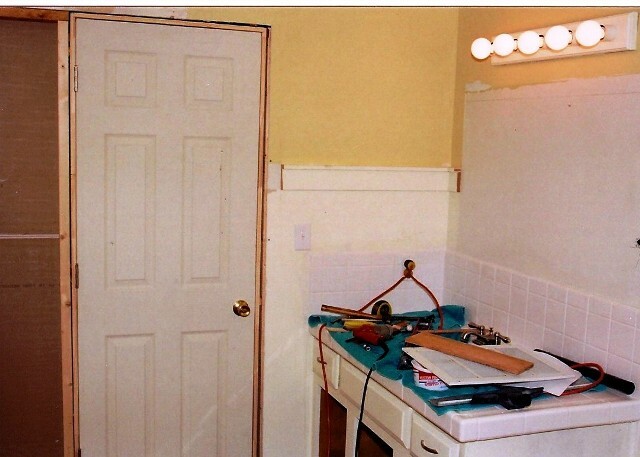 the door is the added space that allowed for storage cabinets to replace the faux oak cabinet that had been near the tub. Also the extremely simple box cabinets add a lot of architectural interest. out all the way. But the benefit of visually blocking the view into the room was worth it. 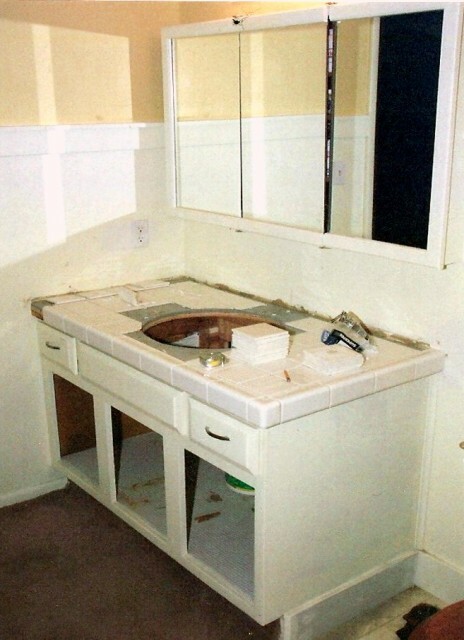 Focusing on the cabinet, the tile was glued and ready for grout and then the sink. 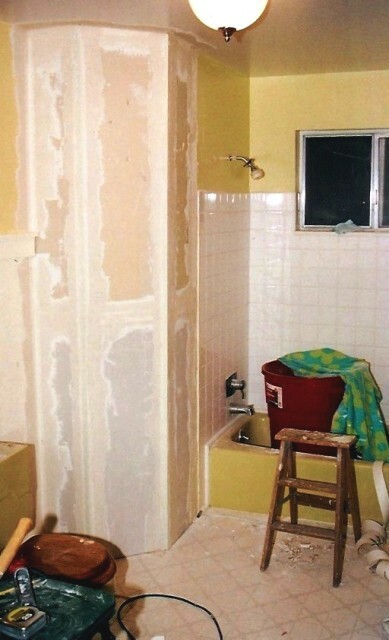 choice of white tile copies the tub tile and does allow for color changes later. 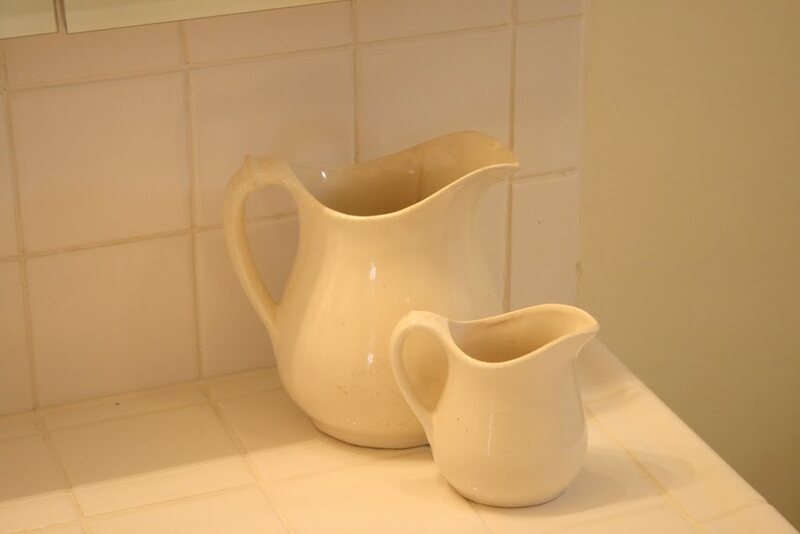 double glaze and is more energy efficient. 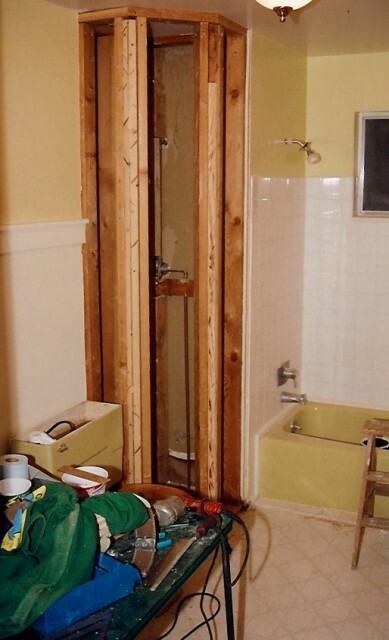 it added drama to the drab former look of the shower. The side curtains are hung on a specially made mounts attached to the wall. to consider installing backing plates at the corners of windows when possible. Using a little silk rope and tassel helps add a classy detail. 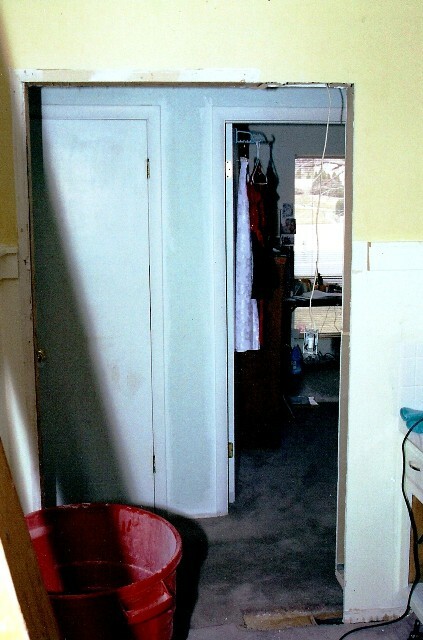 The ropes are attached to a decorative hook on the wall. 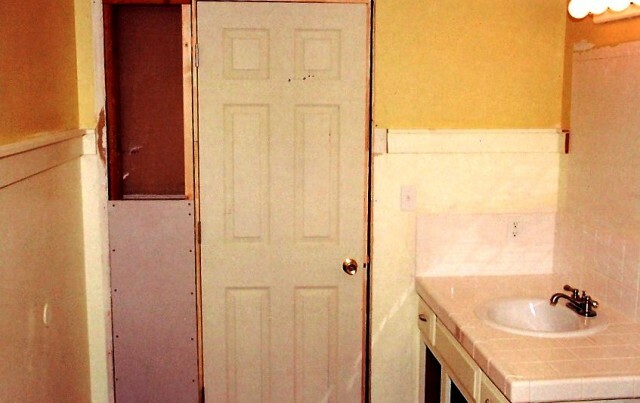 With the door moved over it allowed room for custom cabinets that add space for the bathroom towels and supplies. 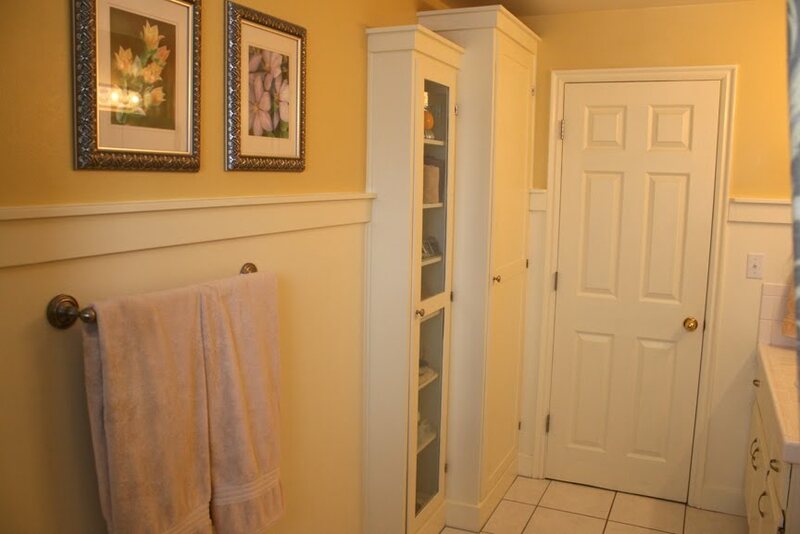 And by repeating the style of the wall trim on the top of the cabinets it gave a nice architectural feel. 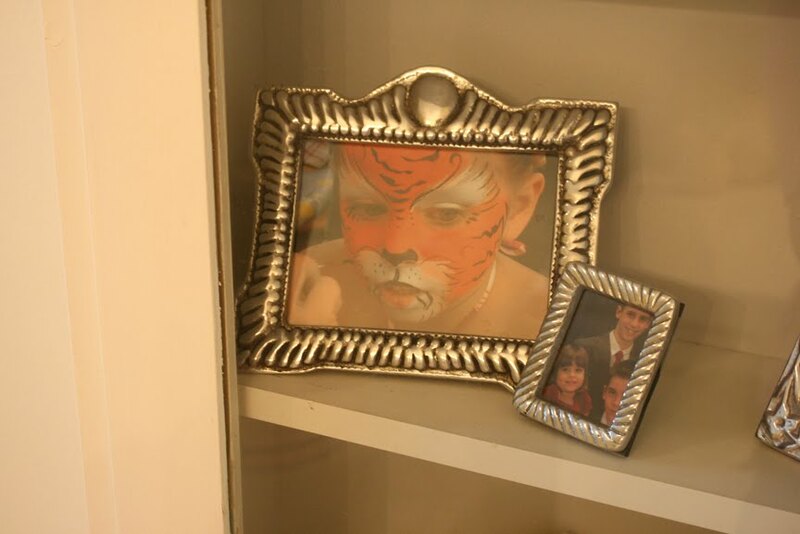 glass and have used the colors of the towels and a few other pictures for display elements. 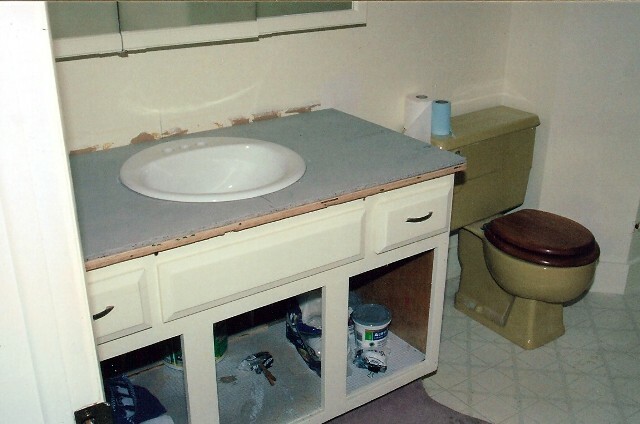 I think they were very successful working around a mustard yellow tub and toilet! This is beautiful! 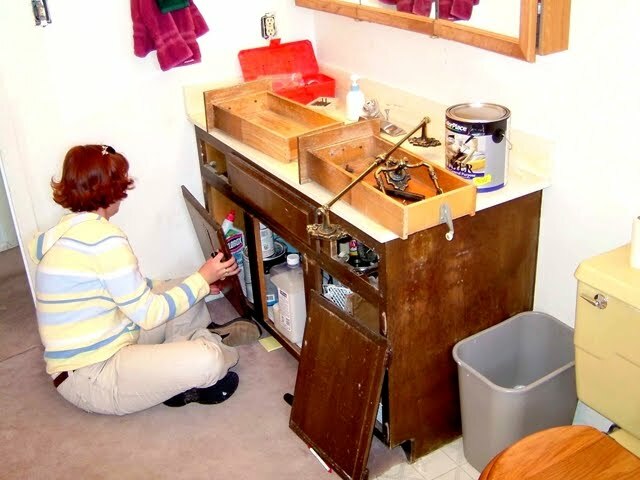 It is great inspiration for those who have the vintage colored tubs and toilets too. I’m so glad it is helpful! I am all in favor of using what is there if it is clean and functional. No sense wasting anything. With the variety of paint and fabric choices, there are plenty of ways to incorporate colored fixtures and/or tile into a bathroom remodel. 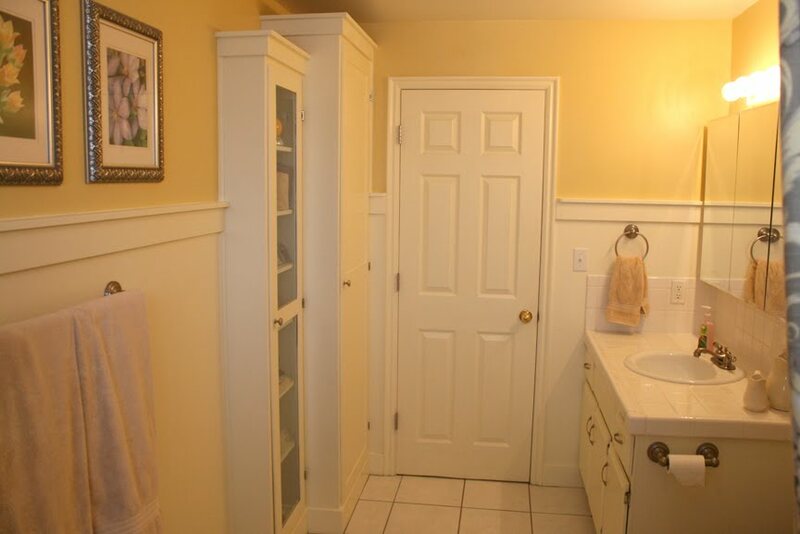 I love what you have done in there, with one suggestion, maybe try painting the toilet seat to match the wall color or the toilet color to make it blend in. 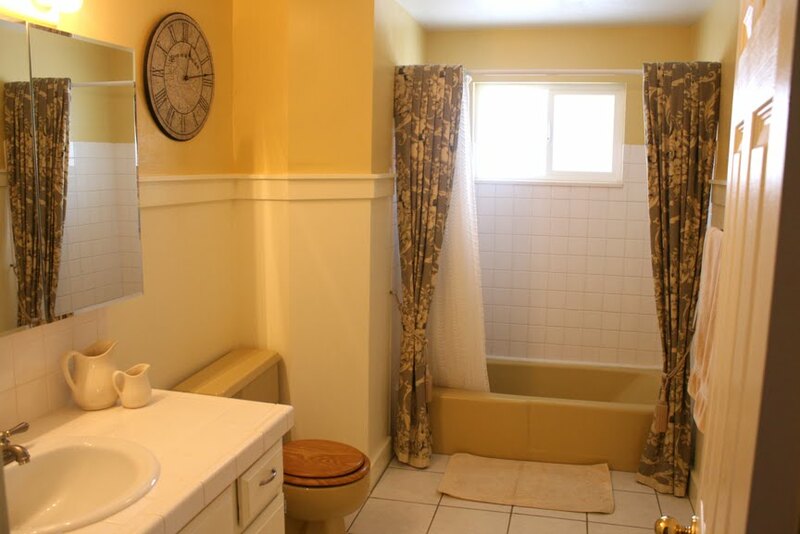 I think a white seat would stand out like a sore thumb and draw even more attention to the toilet color. Congrats on a job well done! Thanks for the comment, Pam!